Shop Gardman Cat-Gard Limited Stock !! 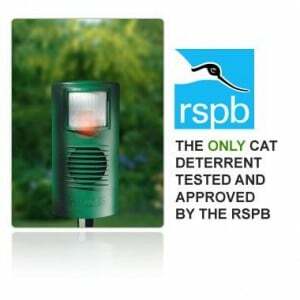 Cat guard protects your garden from cats constantly, catguard is the only cat repeller that remains turned on and does not have to detect moment to work, the signal is turned on 24/7 it does not have a censor. Cat Guard is only available from this website. High frequency signal designed to deter cats Inaudible to humans and will not deter dogs, hedghogs or other pets, wildlife. Protects an area of approximately 20sq metres in a 70 degree arc. Catgard is back, the only cat repeller that remains turned on and does not have a censor, Cat-guard runs off 10 metres of cable includes adapter. No batteries required,works continuously.